If he asks them why they can’t, some of them explain that they just don’t have the time to build and maintain a compost pile. Others say that their yard isn’t big enough, or they don’t have a yard at all. And occasionally, some add that setting up a compost bin is too expensive for the small amount of vegetable waste they have. What they don’t realize is that none of these problems is really a deal breaker. Composting is an incredibly versatile process, and it doesn’t have to take a lot of time, space, or money. No matter which of those resources you’re short on, there’s a composting method out there that can work for you. Any kind of vegetable matter, left to its own devices, will eventually decay. Composting is simply a way of controlling that natural process. When you gather a heap of plant waste together in one place, it breaks down into a dark, crumbly substance called humus that makes an excellent, nutrient-rich fertilizer for home gardens or other landscaping projects. It’s easy to understand why my husband’s coworkers say they would love to compost if they could. It offers a whole list of benefits – for your yard, your wallet, and the Earth. Free Fertilizer. 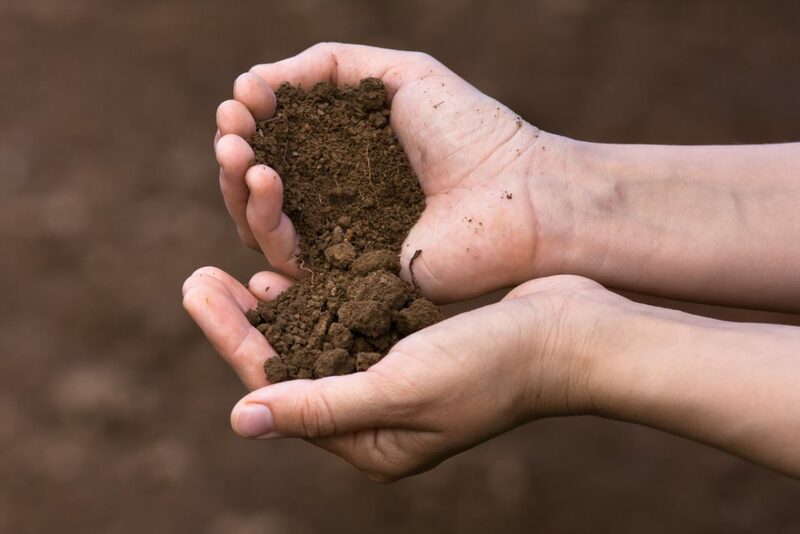 Compost improves the texture of your garden soil, so it holds both water and air better. It also adds nutrients to the soil and promotes healthy root development in garden plants. The icing on the cake is that with home compost, you get all these benefits for free. This year, our home compost bin produced about 50 gallons of finished compost, which would have cost us nearly $100 to buy in bags at a garden center. No Harmful Chemicals. Commercial compost often contains lingering traces of herbicides, so using it in your garden can actually kill your plants instead of nourishing them. This problem is known as “killer compost.” When you make your own compost, you can keep it free of dangerous chemicals. Less Waste. According to the Environmental Protection Agency (EPA), food scraps and yard waste make up 20% to 30% of your household trash. If your town charges you by the bag for household trash pickup, putting that waste in the compost bin instead of out by the curb shaves up to 30% off your annual bill. A Cleaner Planet. Composting is an eco-friendly activity in more ways than one. When vegetable matter breaks down in a landfill, it produces methane, a powerful greenhouse gas. In a compost pile, decaying waste produces far less methane, so composting is actually a way to fight global warming. On top of that, using finished compost for gardening reduces the need for chemical fertilizers, which can pollute the water supply and kill fish. Paper Products. You can compost office paper, newspaper, cardboard, and toilet paper rolls. It’s best to shred these materials before adding them to the bin so they break down faster and don’t get matted. The compost guide from Eartheasy, a natural products store, warns that you should not compost glossy paper or paper with colored ink. Dry Yard Waste. This includes dry leaves, pine needles, straw, and small twigs. Hay, which contains seeds, is also compostable, but it isn’t ideal because of the risk that seeds could sprout in the compost. Small branches and twigs can go in, but they take a long time to break down. Don’t use large amounts of pine needles, which are highly acidic, and don’t compost leaves or twigs from black walnut trees. Woody Waste. Wood chips, clean sawdust, and even ashes from clean materials can all go into compost. However, these materials are all very high in carbon, so use them sparingly. Kitchen Scraps. Fruit and vegetable peels, coffee grounds, tea bags (with the staples removed), nut shells, and crushed eggshells can all go in compost. However, meat, bones, and fish scraps should not, because they can attract pests to the compost pile. Dairy products and greasy or oily foods also should not go into compost. Peels from oranges, peaches, or bananas can have pesticide residue, but this should not be a problem with organic fruits. Moist Yard Waste. You can compost green leaves, stems, flowers, and grass clippings, as long as the grass has not been treated with herbicide. Weeds can go in the compost bin only if they have not gone to seed. If they have, the seeds sprout in whatever garden bed you spread your compost on. Also, do not put any diseased plants into the compost pile. Some Animal Wastes. Manure from chickens, cows, horses, and rabbits is safe to compost. In fact, animal droppings can be a great “compost activator”: Adding them to the pile makes the rest of the waste break down faster. However, do not add pet manure if you plan to use the finished compost on food crops, because it could spread disease. According to most composting guides online, the best way to make compost is in a large, carefully constructed pile: at least three feet on each side, with green and brown materials added in layers. To make it break down faster, you should cover it to hold in heat, add enough water to keep it moist, and turn the material over with a pitchfork regularly to add air – ideally, every time you add anything to the pile. All this sounds like an awful lot of work, which is probably the reason my husband’s coworkers think it’s unfeasible. They assume it’s just not possible to make your own compost without a lot of space for the pile and a lot of time to maintain it. However, even if an actively managed pile is the best way to make compost, it’s far from the only way. In fact, there are countless methods for making compost: open piles and enclosed bins, large piles and small ones, regular turning and passive “cold” composting. Some methods are faster than others, but given enough time, all can yield rich, nourishing compost. The main point of the elaborate instructions most guides provide for making compost – making a large pile, layering greens and browns, turning the pile regularly, and so on – is to keep the pile warm. Getting its center to a temperature between 140°F and 155°F kills weed seeds and pathogens, and keeping it warm keeps the compost “cooking” so it breaks down as fast as possible. Using this “hot composting” method produces finished, usable compost in anywhere from a few weeks to a few months. However, if you’re willing to wait a year or two for your finished compost, you can cut out most of the work with the “cold composting” method. This is the system my husband and I use in our yard, and it couldn’t be any simpler: Just put all your vegetable waste in the compost bin and leave it there. You can speed it along by turning the pile once in a while, but even if you don’t bother, the waste still breaks down eventually. We had our bin about a year before we pulled any usable compost out of it, but the finished product was just as dark and rich as anything we could have bought in a bag. For those who are both lazy and impatient, it’s possible to speed up the cold composting process. When you first build your compost pile, be sure to include plenty of coarse material, such as straw, hay, weeds, or even crumpled sheets of newspaper. Spreading these materials evenly throughout the pile traps tiny pockets of air in the compost, so it stays aerated without having to be turned by hand. 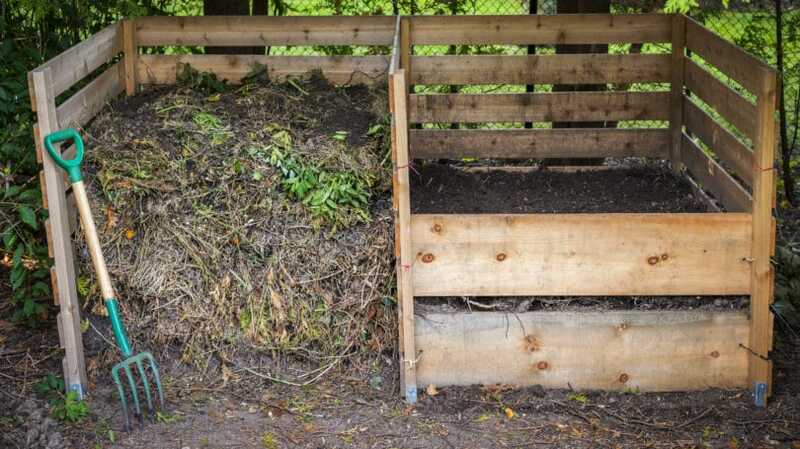 A compost pile doesn’t have to take up a lot of space. If you have a small yard, you can keep your pile neatly contained in an enclosed bin. Open-Top Bins. An open compost bin is basically just a box for keeping plant matter contained while it breaks down. It can be made of wire mesh, wood, or sturdy plastic, with some openings in the sides to let air in. Open bins cost anywhere from $40 to $200. If you keep your compost in this kind of bin, you have to open one side from time to time to turn the pile. Closed-Top Bins. Fully enclosed bins, also known as compost digesters, come in a wide variety of designs, from simple cone shapes to complex, multi-chambered composters, ranging in price from $100 to $400. They are usually made of plastic, with a lid on top that you can open to drop in waste and some sort of door at the bottom for removing finished compost. An enclosed compost bin keeps out unwanted animals, but it also keeps out rain, so you have to add water to keep the pile moist. Compost in an enclosed bin can’t be turned, so it takes longer to break down, but it’s also less work. Compost Tumblers. A compost tumbler is a metal or plastic barrel mounted on a frame so that it can rotate freely. You open a hinged door to insert waste, then close it and rotate the barrel to turn the pile. This design keeps out rain and animals while still breaking waste down at a reasonable rate, but you can’t add more material to the tumbler once it’s full. Tumblers are the most expensive type of compost bin, with prices ranging from around $250 to $800. Even if you have no yard at all, you can still compost your kitchen scraps with a vermicomposting system. With this method, you put your vegetable waste into an enclosed bin filled with worms known as red wigglers. 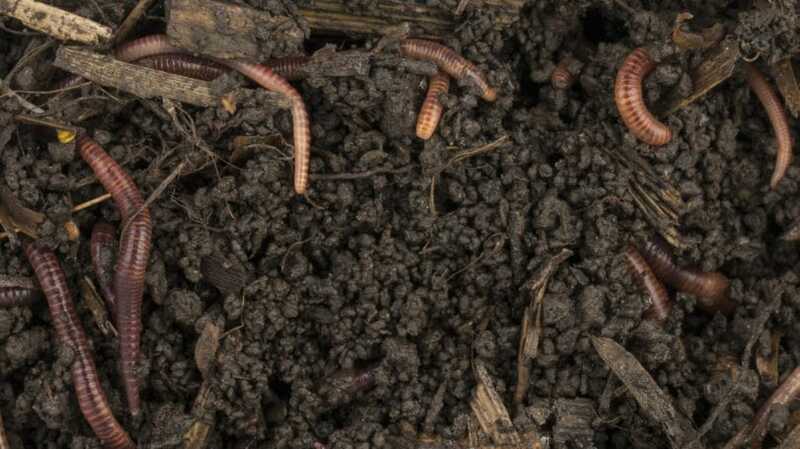 The worms digest the waste and turn it into worm castings, also known as vermicompost, a rich brown material that makes excellent fertilizer for plants. Worm Bin. The worms need to be kept in an enclosed bin 8 to 14 inches deep, made of an opaque material to keep out light. It should have a tight-fitting lid and holes for ventilation. You can buy a ready-made bin, build one out of wood, or convert a plastic storage bin. Keep the bin indoors or in a spot at normal indoor temperatures – between 59°F and 77°F is ideal, but worms can survive at any temperature between 32°F and 95°F. Worm Bedding. You can use any combination of dry leaves, shredded paper, straw, sawdust, coconut fiber (coir), or finished compost. Before adding the bedding to the bin, soak it in water and then wring it out so that it’s about as moist as a damp sponge, and fluff it up as you place it in the bin. When the bin is about half-full – that is, at least four inches – mix in a handful of plain dirt. Worms. Ordinary garden worms won’t work for vermicomposting – you need red wigglers, which are a species called Eisinia fetida. You can order these from garden supply catalogs or online. A home bin requires about one pound of red wigglers, which costs about $20. You can also buy an entire vermicomposting setup, complete with worms, for about $100. These ready-made kits have multiple stacking trays, making it easier to remove the finished compost. Vegetable Matter. The last step is to feed the worms. They can eat nearly any kind of vegetable waste, including vegetable scraps, most fruit scraps and peels, coffee grounds, tea bags, and moistened bread, but they cannot eat meat, fish, dairy products, bones, greasy foods, or citrus fruits and peels. It’s also best to avoid smelly foods like onions, which can make the bin smell bad. Each time you add food, cover it with two inches of bedding, and wait until the worms consume it before adding more. 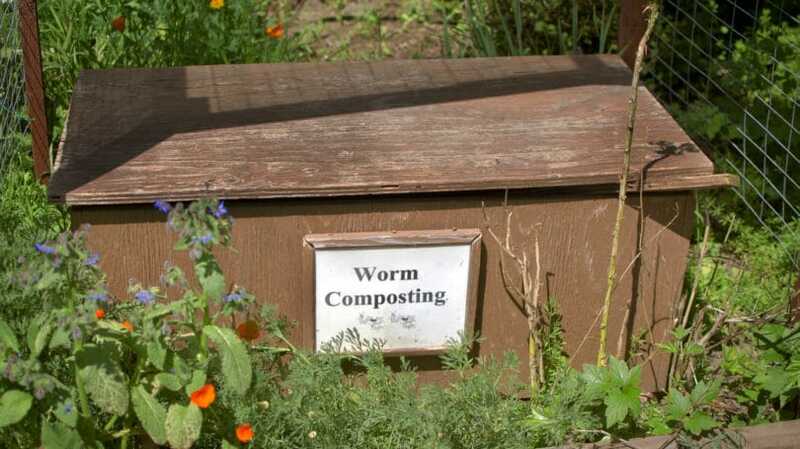 A worm compost bin takes three to six months to produce finished compost. To harvest it, you can dump out the entire contents of the bin onto a plastic sheet, remove the worm castings, and then reassemble the bin with fresh bedding before returning the worms to it. However, an easier way is to add food to only one side of the bin for a few weeks so that all the worms move to that side. You can then safely scoop the compost out of the other side, add fresh bedding, and start feeding the worms on that side. You don’t need to shell out hundreds of dollars for a fancy system to make your own compost. Ready-made bins and tumblers can certainly make the process easier. 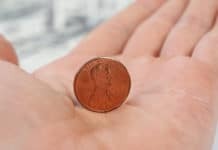 However, if you’re short on cash, you can put together a simple home system for very little money. The simplest setup of all is an open compost pile. All you need for this is a corner of your yard where you can pile up all your vegetable waste and let it rot. However, an open pile takes up a fair amount of room, especially if you want to turn it with a pitchfork so it breaks down faster. It also needs to be in a spot that’s well out of the way, since an open compost pile doesn’t look great and doesn’t always smell great either. If you want to keep your compost a bit more contained, you can build a basic DIY compost bin. For instance, you can enclose your pile in chicken wire, perforated plastic sheeting, or a simple box built of scrap wood. Another good, inexpensive material for a compost bin is shipping pallets, which you can often pick up for free from large stores that don’t want to pay to dispose of them. We built our home compost bin out of pallets scavenged from my husband’s workplace, using instructions we found online, and only had to spend a few dollars on hardware to put it together. An open pile or bin is fine for garden waste, but if you want to add food scraps, you need an enclosed bin to keep out rodents. The cheapest way to make a fully enclosed compost bin is to start with a large, heavy-duty, cylindrical garbage can and drill holes around the sides for aeration. When the lid is securely in place, you can turn the can on its side and roll it back and forth on the ground to tumble your compost. The composting process doesn’t always run smoothly. Bins are prone to a variety of problems, including pests, odors, clumping, and dampness. Fortunately, most of these problems have a simple fix. Pests. Fruit and vegetable scraps can attract small flying insects, such as fruit flies. To discourage them, keep a pile of grass clippings near the bin and use them to cover exposed food scraps. To deter larger animals, such as raccoons, the best solution is an enclosed compost bin. Odors. Many people hesitate to start a compost pile for fear that it will smell bad. However, as long as you avoid putting meat or bones into the compost and keep food scraps buried, odors aren’t usually a problem. If your pile smells like ammonia, it probably contains too much green material, so you should add more coarse brown materials, such as leaves, paper, or sawdust. A smell like rotten eggs is usually due to too much moisture or too little air – to fix it, add some coarse brown material and give the pile a turn. Clumping. Wet materials, such as leaves, can stick together in a compost bin and form mats that keep the pile from breaking down evenly. Add these materials in small batches or use a pitchfork to break them up and mix them in thoroughly. Dampness. In the wintertime, an exposed compost pile can become waterlogged, leaving you with a soggy, unusable mess in spring. To avoid this problem, keep the compost pile covered, particularly in wet weather. However, if your pile is already soaked, all is not lost. 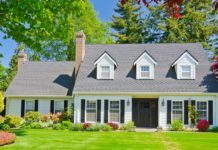 You can correct the problem by turning the pile and adding lots of fine brown material that breaks down quickly, such as shredded leaves, peat moss, or straw. Slow Decay. If your pile seems to be taking forever to produce any usable compost, there are several possible causes. If the pile is too small, add more material; if it’s too compressed, turn it; if it’s too dry, add water. Keeping the pile covered and insulated in cold weather also speeds up the decay process. If none of this works, your pile is probably lacking in nitrogen, so adding more green material – grass clippings, food scraps, or animal manure – should do the trick. Plants grow up out of the soil, and when they die, they break down and go back to the soil. Instead of barren dust and ashes, they turn into rich, fertile dirt that nourishes new plants, continuing an endless, natural cycle. And with a simple home compost bin and a little bit of effort, you can be a link in that chain. Do you compost at home?